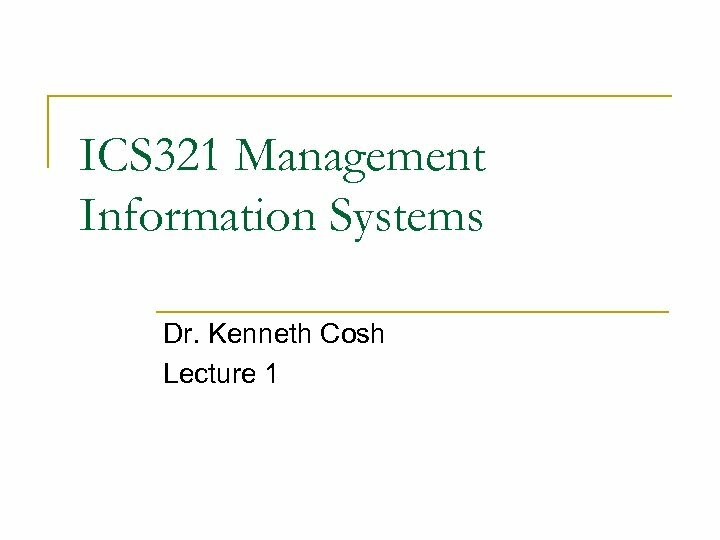 M. I. S. n n n ICS 321 3(3 -0 -6) credits. 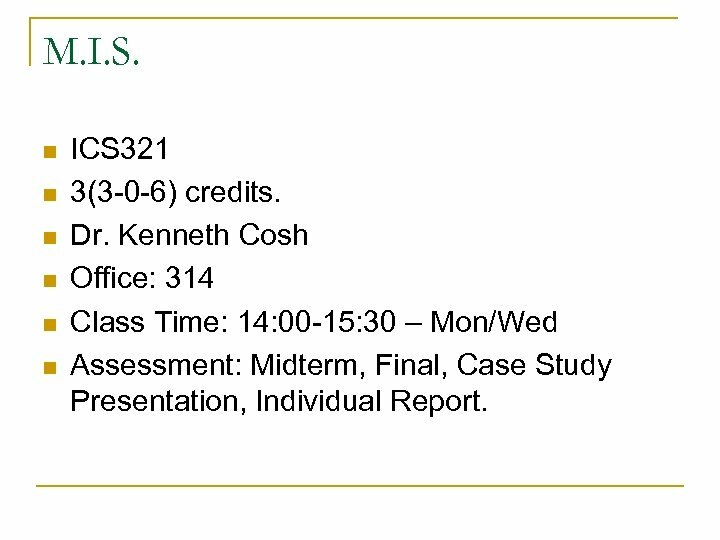 Dr. Kenneth Cosh Office: 314 Class Time: 14: 00 -15: 30 – Mon/Wed Assessment: Midterm, Final, Case Study Presentation, Individual Report. 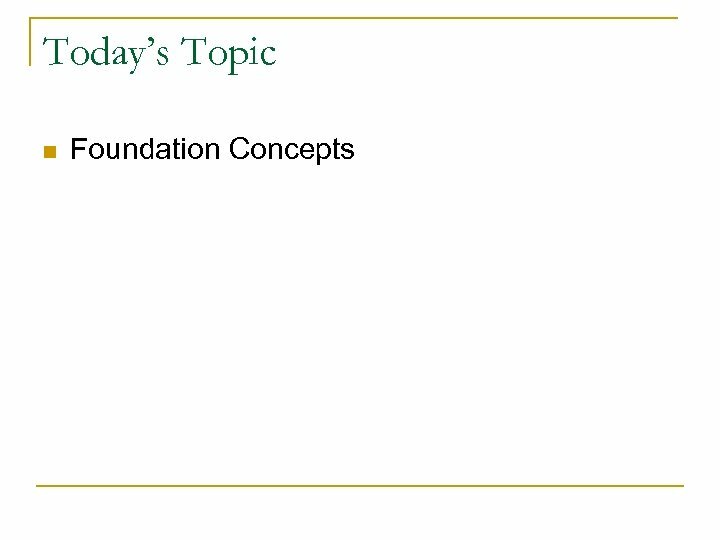 What is M. I. S. ? 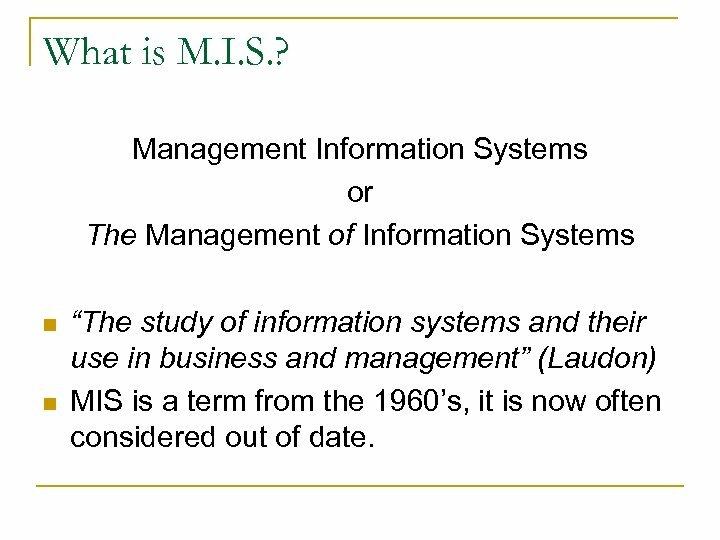 Management Information Systems or The Management of Information Systems n n “The study of information systems and their use in business and management” (Laudon) MIS is a term from the 1960’s, it is now often considered out of date. 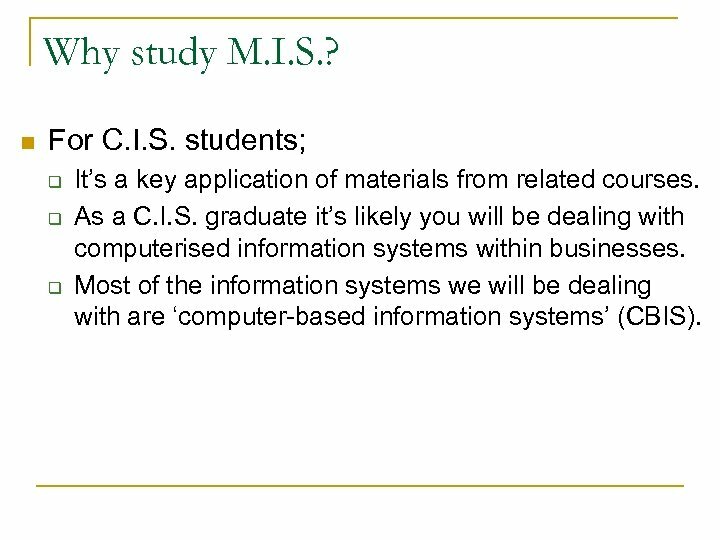 Why study M. I. S. ? 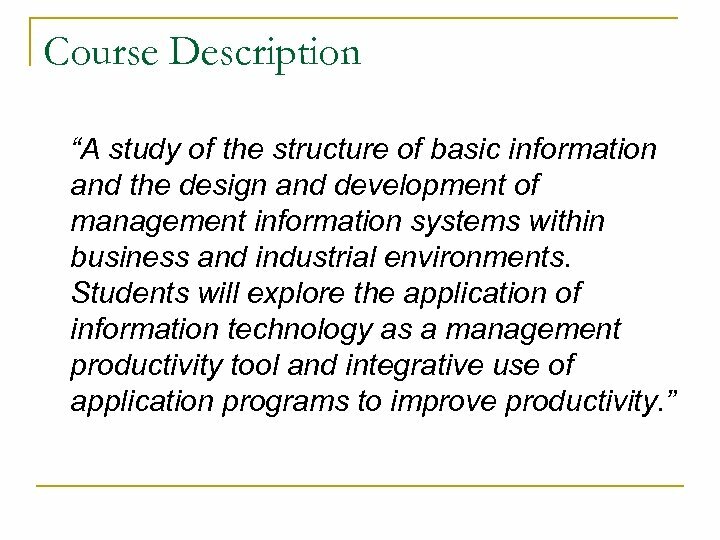 n For C. I. S. students; q q q It’s a key application of materials from related courses. 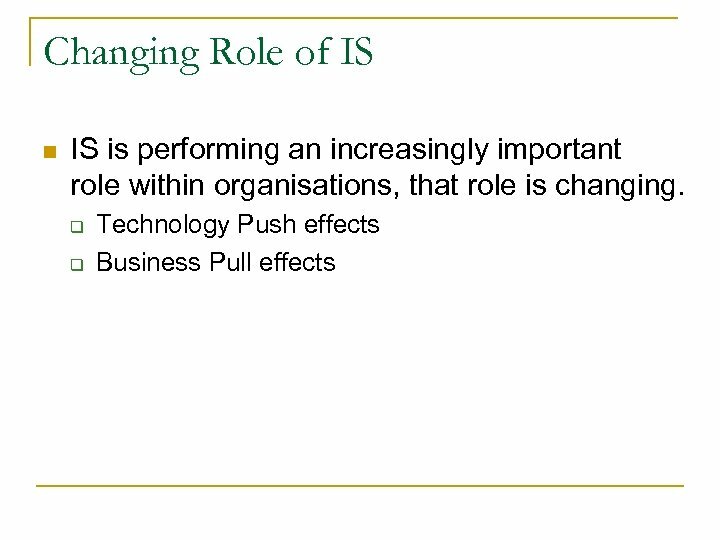 As a C. I. S. graduate it’s likely you will be dealing with computerised information systems within businesses. 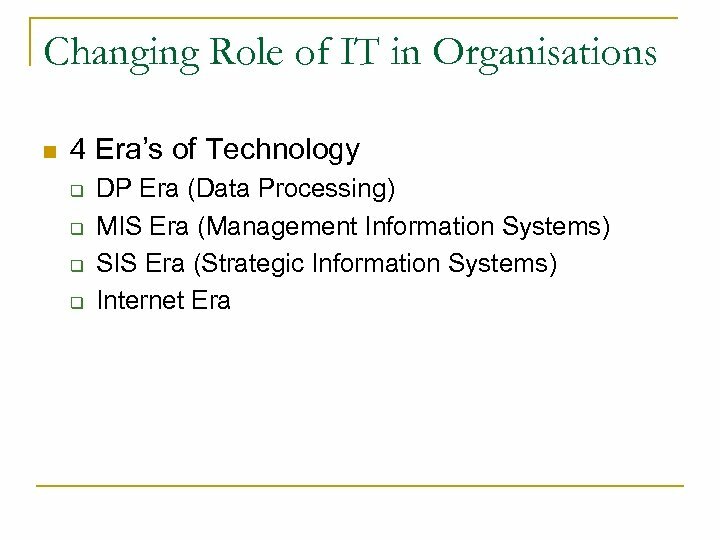 Most of the information systems we will be dealing with are ‘computer-based information systems’ (CBIS). 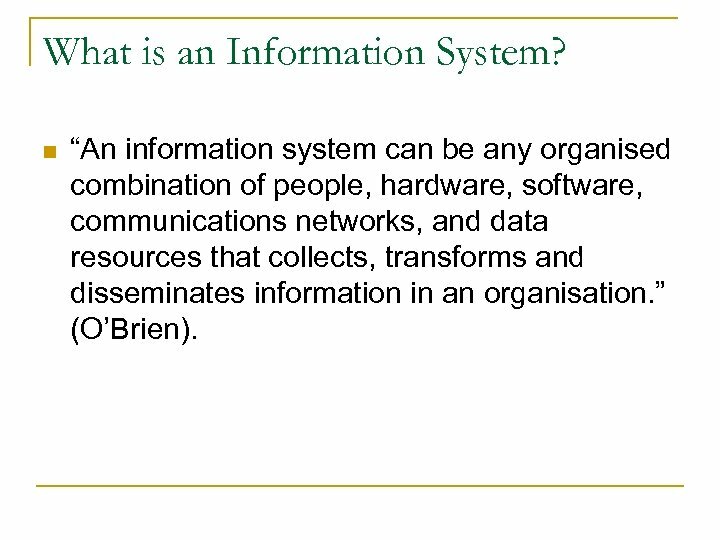 What is an Information System? 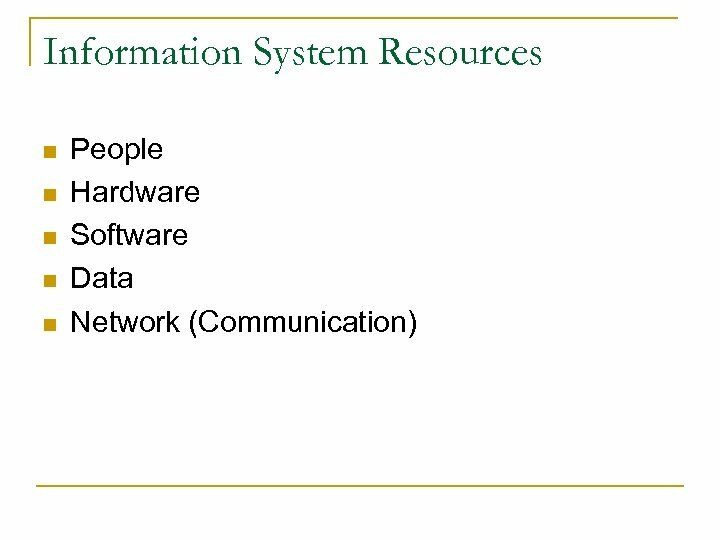 n “An information system can be any organised combination of people, hardware, software, communications networks, and data resources that collects, transforms and disseminates information in an organisation. 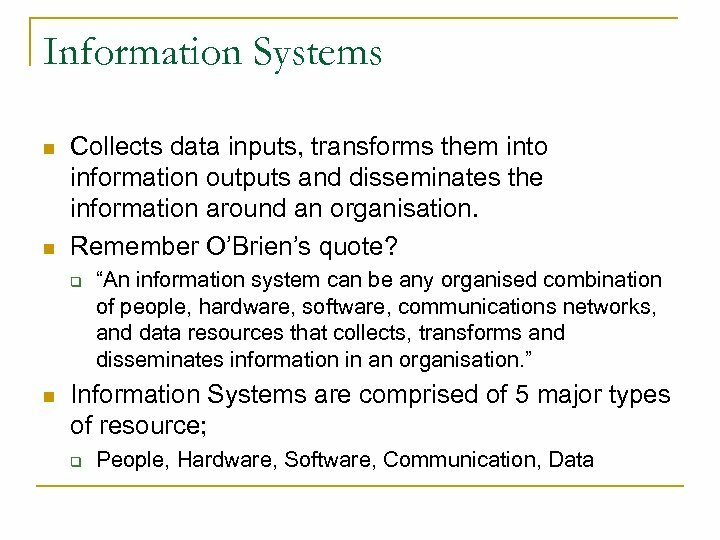 ” (O’Brien). 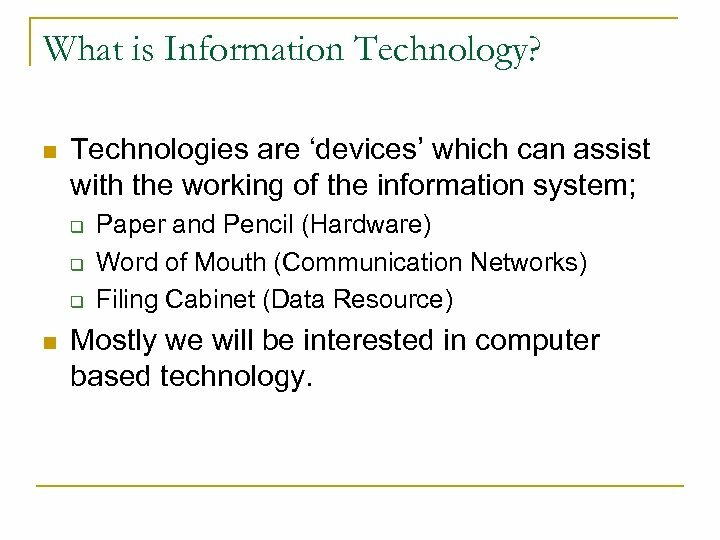 What is Information Technology? 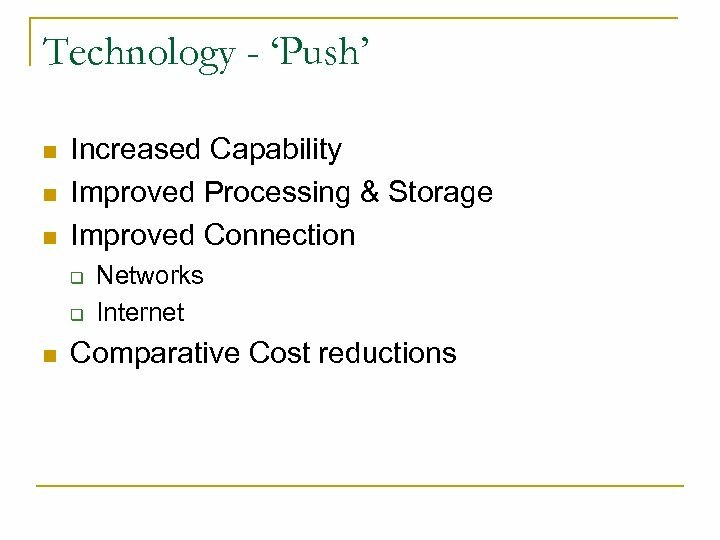 n Technologies are ‘devices’ which can assist with the working of the information system; q q q n Paper and Pencil (Hardware) Word of Mouth (Communication Networks) Filing Cabinet (Data Resource) Mostly we will be interested in computer based technology. 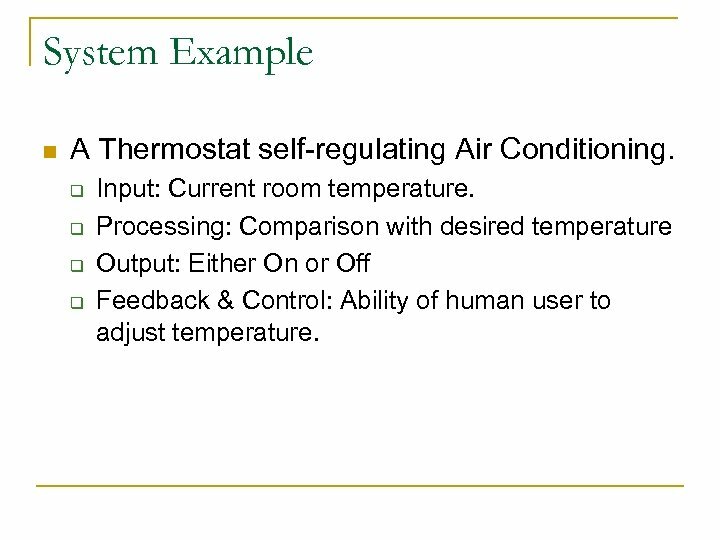 System Example n A Thermostat self-regulating Air Conditioning. q q Input: Current room temperature. 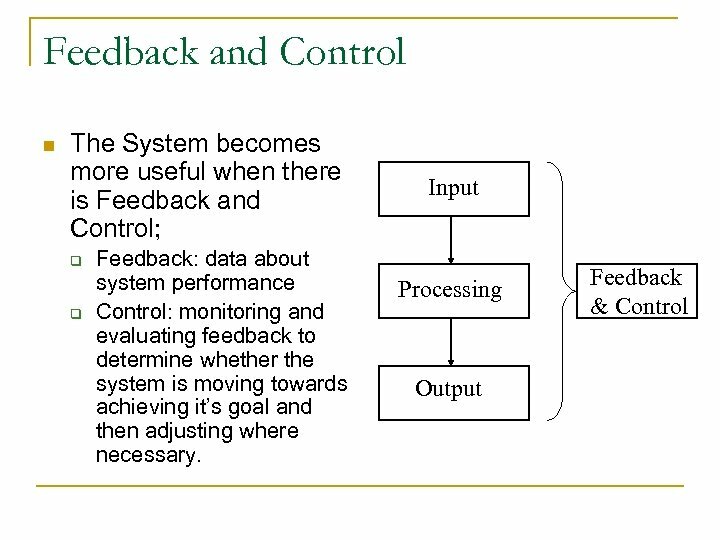 Processing: Comparison with desired temperature Output: Either On or Off Feedback & Control: Ability of human user to adjust temperature. 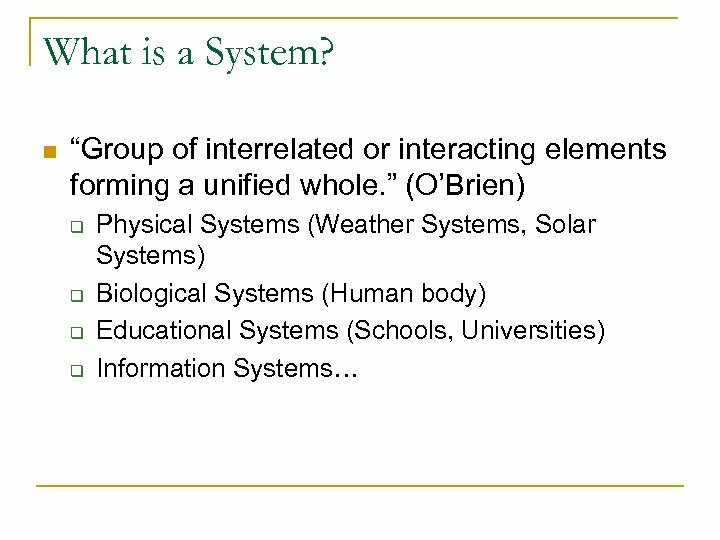 Further System Concepts n Sub-systems q n Interfacing Systems q q n Systems rarely exist within a vacuum, they are normally part of some environment (or greater system). 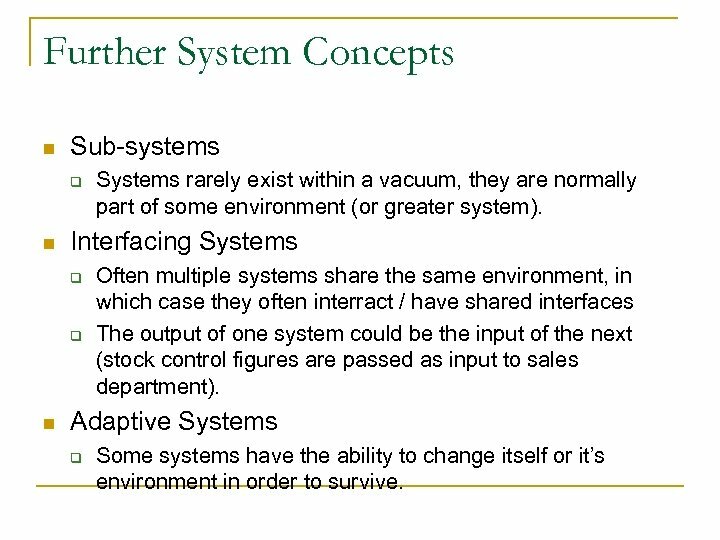 Often multiple systems share the same environment, in which case they often interract / have shared interfaces The output of one system could be the input of the next (stock control figures are passed as input to sales department). 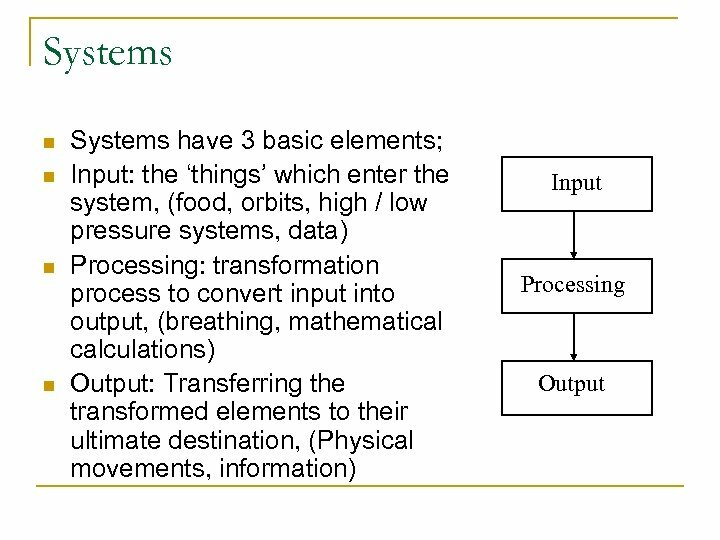 Adaptive Systems q Some systems have the ability to change itself or it’s environment in order to survive. 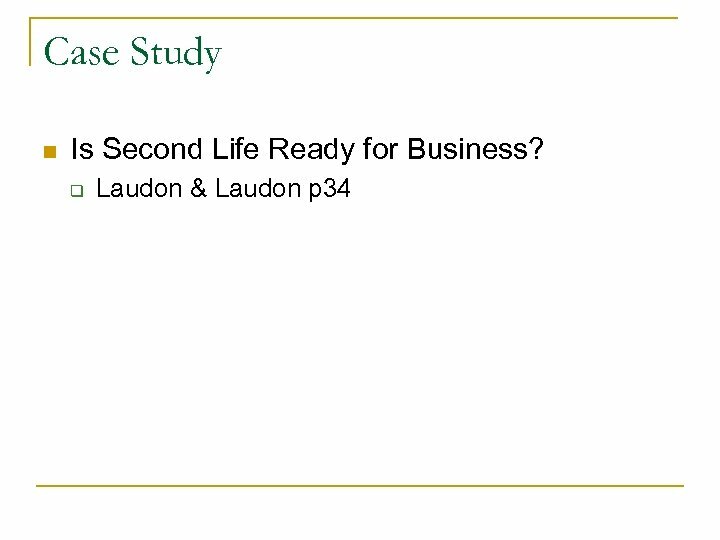 Case Study n UPS Competes Globally with Information Technology q Laudon & Laudon p 16. 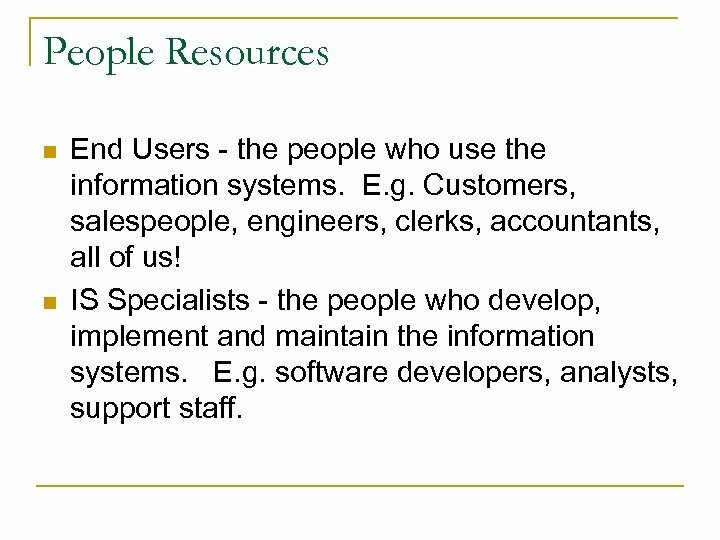 People Resources n n End Users - the people who use the information systems. E. g. Customers, salespeople, engineers, clerks, accountants, all of us! 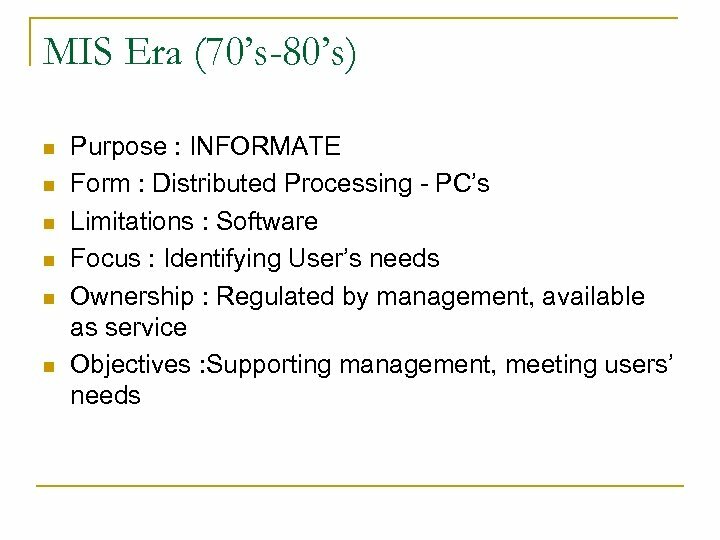 IS Specialists - the people who develop, implement and maintain the information systems. 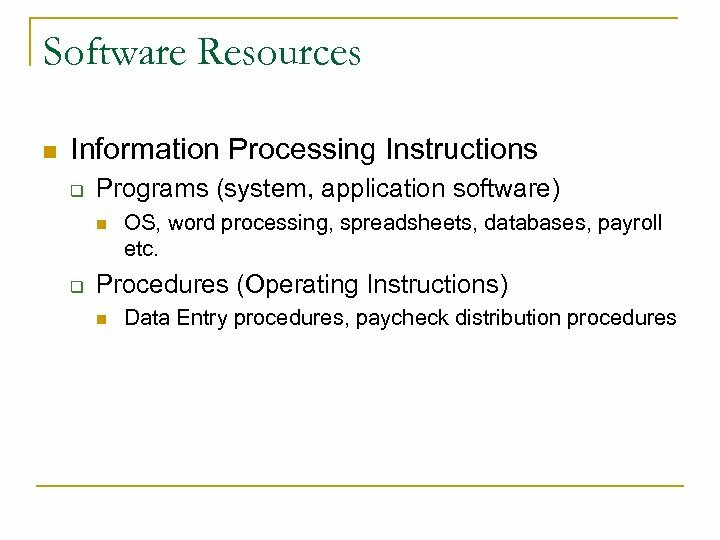 E. g. software developers, analysts, support staff. 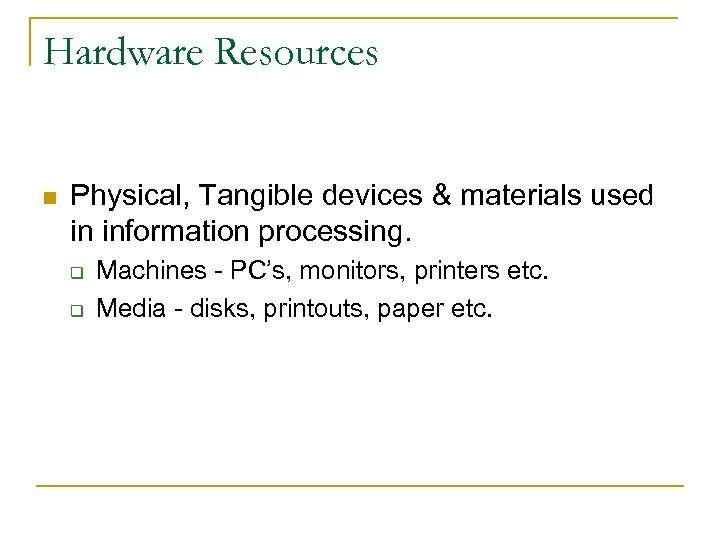 Hardware Resources n Physical, Tangible devices & materials used in information processing. 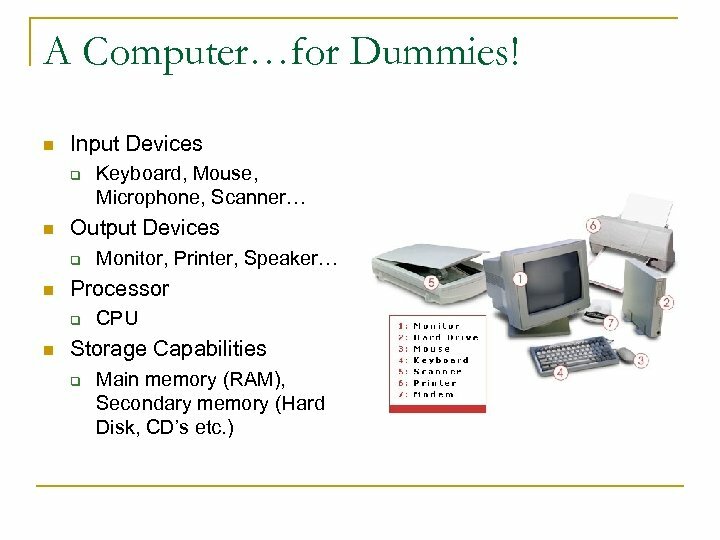 q q Machines - PC’s, monitors, printers etc. Media - disks, printouts, paper etc. 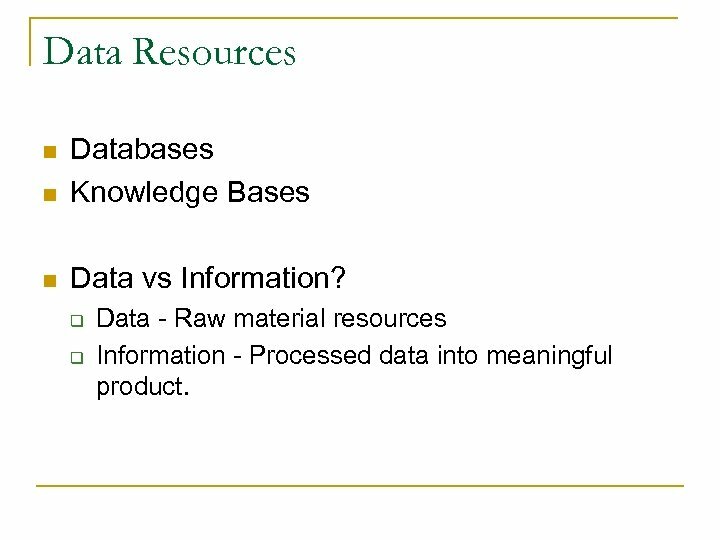 Data Resources n Databases Knowledge Bases n Data vs Information? 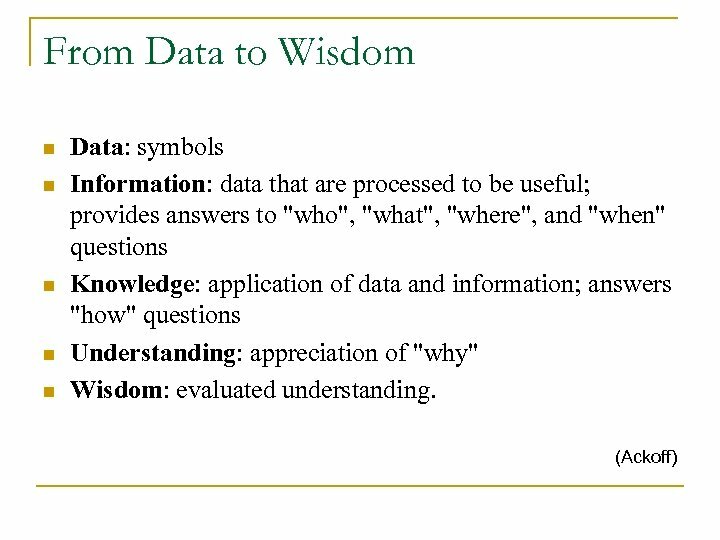 n q q Data - Raw material resources Information - Processed data into meaningful product. 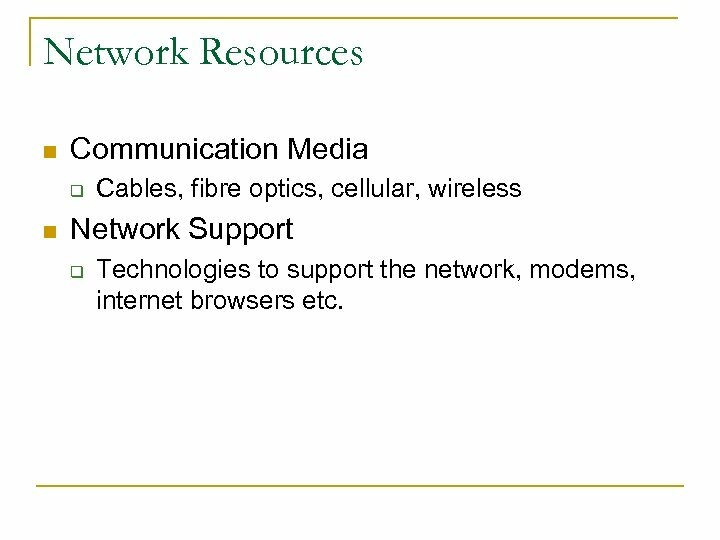 Network Resources n Communication Media q n Cables, fibre optics, cellular, wireless Network Support q Technologies to support the network, modems, internet browsers etc. 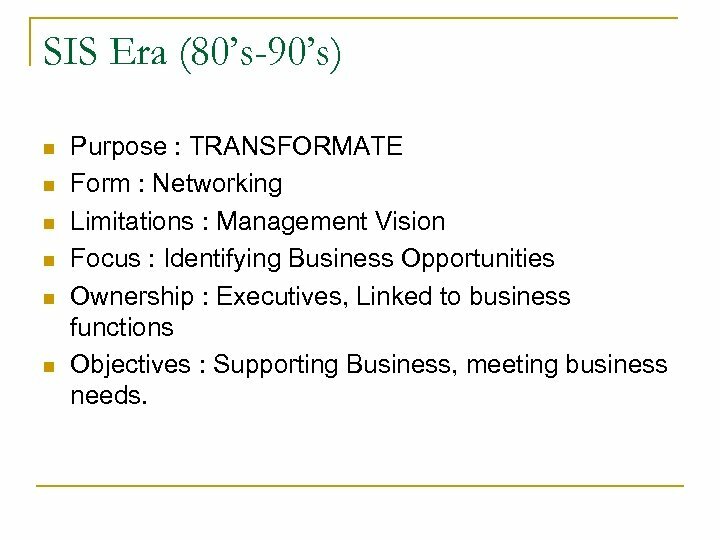 SIS Era (80’s-90’s) n n n Purpose : TRANSFORMATE Form : Networking Limitations : Management Vision Focus : Identifying Business Opportunities Ownership : Executives, Linked to business functions Objectives : Supporting Business, meeting business needs. 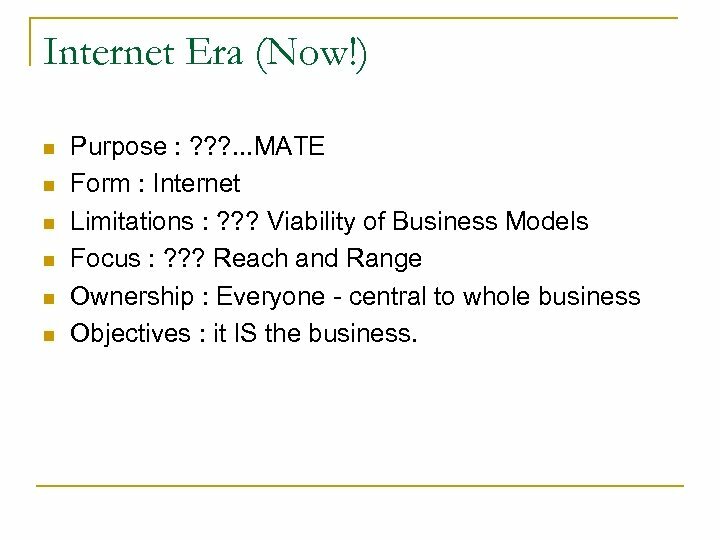 Internet Era (Now!) n n n Purpose : ? ? ? . 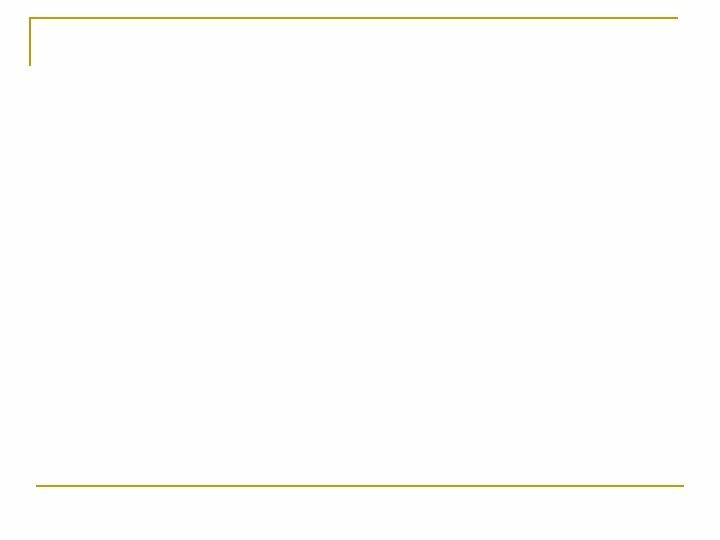 . . MATE Form : Internet Limitations : ? ? ? 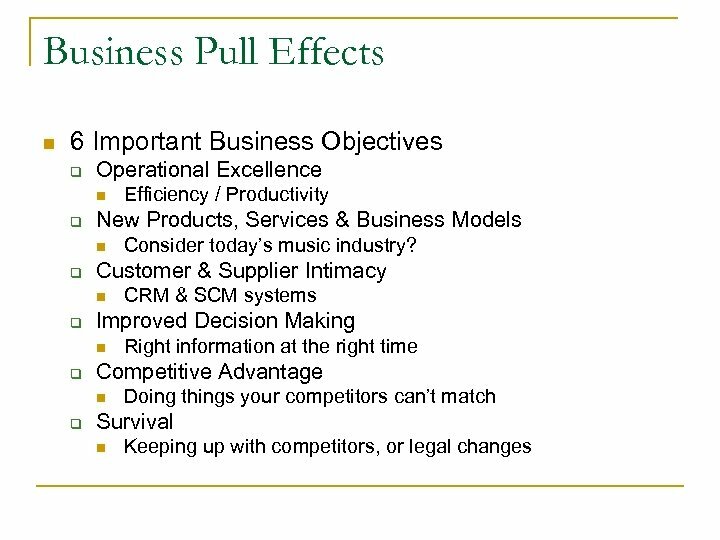 Viability of Business Models Focus : ? ? ? 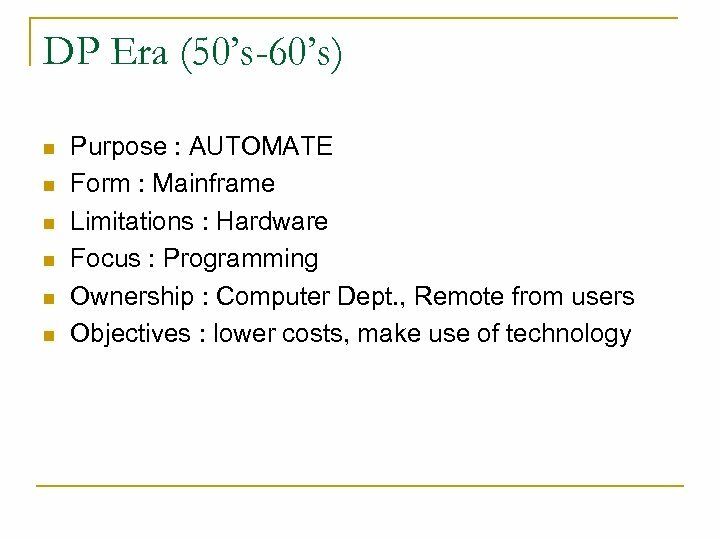 Reach and Range Ownership : Everyone - central to whole business Objectives : it IS the business.